Industrial robots are mechanical devices which, to a certain degree, replicate human motions. They are used whenever there is a need to reduce the danger to a human, provide more strength or accuracy than a human, or when continuous operation is required. Most robots are stationary, but some move throughout the workplace delivering materials and supplies. Many people think of robots as the humanoid-type monsters that are seen in science fiction and fantasy movies. While we may someday have the technical ability to produce such a machine, today's robots are actually quite simple devices. Motions that we take for granted—picking up a coin from the table, for instance—are considerably more difficult for a robot. Our brain processes thousands of variable bits of data from our eyes to instruct our arm, wrist, hand, and fingers to reach, grasp, and pick up the coin. Even the tactile feel of the coin constantly updates our brain to provide just enough finger pressure to grip the coin securely. Any variations in position are effortlessly compensated for in our brain. To easily and economically program an industrial robot to perform the same task, many of these variables must be restricted or eliminated. Position, reach, weight, and grasp should remain as consistent as possible so that variations do not result in missing or dropping the object. 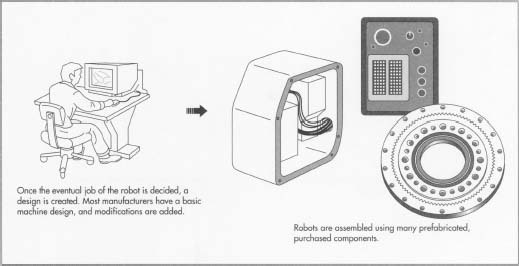 The computer that controls the robot must be programmed by a technician, to "teach" the machine to complete the motion. The areas where robots perform better than humans are in accuracy and repeatability. While some people could pick up the coin with similar motions each time, the robot can perform the operation with exactly the same motions without tiring. Many robots can repeat motions with an accuracy of a few thousandths of an inch and operate 24 hours a day. Because of this tireless, accurate work, robots are a growing segment of industrial equipment purchases. Most are used for repetitive painting and welding operations, while others, known as pick-and-place robots, are used to lift and place products into machines and packages. Robots, or "robotics," are a segment of the broader science of automation. Automation uses machines and computers which can learn or compensate for varying conditions of operation. The term robot can be traced to the Czech word robota, which means compulsory labor. The term first appeared in 1921 in the play "R.U.R." (Rossum's Universal Robots) by Czech dramatist Karel Capek. The play described humanoid robots that destroyed their human makers—much the same plot of some modern science fiction thrillers. Practical robots were first attempted after the development of the computer. In the late 1960s, the Stanford Research Institute designed and built an experimental robot called "SHAKEY." Using a television camera and a computer, this machine was capable of moving and arranging blocks into stacks. General Motors financed a program at the Massachusetts Institute of Technology in the mid-1970s to develop an automated robot for assembly purposes. Here, researcher Victor Scheinman invented the PUMA (programmable universal manipulator for assembly), and the entry of robots into American industry began. Robots are mostly built of common materials. Some specialized robots for clean room applications, the space program, or other "high tech" projects may use titanium metal and structural composites of carbon fibers. The operating environment and strength required are major factors in material selection. Steel, cast iron, and aluminum are most often used for the arms and bases of robots. If the robot is mobile, they usually equip them with rubber tires for quiet operation and a positive grip on the floor. Robots contain a significant amount of electronics and wiring, and some are radio or laser controlled. The cylinders and other motion-generating mechanisms contain hydraulic oil or pressurized air. Hoses of silicone, rubber, and braided stainless steel connect these mechanisms to their control valves. To protect the robot from the environment, some exposed areas are covered with flexible neoprene shields and collapsible bellows. Electric motors and linear drives are purchased from automation suppliers along with the controller, or "brain." Controllers are housed in steel electrical cabinets located near the robot's work area or carried on board the robot itself. 1 Every robot begins with the design phase. These and other factors must be accounted for in the design: job to be performed; speed of operation; environment of operation; hazardous materials involved; length of reach; path of travel; process variables; human involvement; controller capability; and result of failures. Most manufacturers have a basic machine design to which they incorporate modifications and accessories to meet the specific requirements of the application. 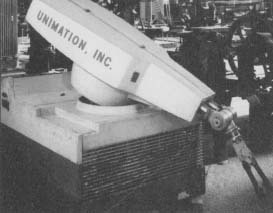 The first robot installed in American industry, this Unimate "pick-and-place" uni) first removed hot metal parts from a die-casting machine at a GM plant in Trenton, New Jersey, in 1961. Robots, like any tool, are only as good as the people wielding them. They cannot do jobs they were not designed or programmed to do. They are most effective when the overall system and processes are carefully planned. In addition, workers responsible for them have to be fully educated and trained as well. In the 1980s, the General Motors Corporation spent upwards of $40 billion on new technologies, many hundreds of millions on robots. Unfortunately, the company did not spend nearly enough on understanding the systems and processes that the robots were supposed to revolutionize or on the people who were to maintain and operate them. The GM plant in Hamtramck, Michigan, was supposed to be a showcase for the company. Instead, by 1988 it was the site of some of the worst in technological utopianism. Robots on the line sometimes painted each other rather than the car bodies passing by; robots occasionally went out of control and smashed into the passing vehicles; a robot designed to install windshields was found systematically smashing them. Once, when a robot ceased working, technicians did not know how to fix it. A hurried call to the manufacturer brought a technician on the next plane. He looked at the robot, pushed the "Reset" button, and the machine was once again operational. usually heavy, to prevent the robot from tipping over. It is made by casting or by welding, then machined. Many robot manufacturers use robots to weld parts for new ones. Those areas that mate with the rest of the robot are machined with close dimensional control to assure proper fit and operation of the attaching components. Likewise, the main column and arms are constructed to fit accurately into the final assembly. Robots are assembled using a substantial amount of purchased components such as electric motors, hydraulic cylinders, bearings, wiring, controllers, and other important parts. An industrial robot can contain 2,000 individual parts and is assembled by teams. These teams begin with the base, and assemble components into the robot until it is complete and ready for testing and finishing. To begin the assembly process, mobile robots first have the traction motors, batteries, axles, wheels, and tires mounted. Stationary robots do not require these items. They are temporarily bolted to the floor for stability during assembly. The moving columns and arms are subassembled with their respective drive motors and then attached to the base. The base contains a ring gear that is motor driven to provide the turning motion. It must mate closely with the drive gear contained in the column. Thrust bearings support the weight of column and arms on the base. A magnetic scale surrounds the bearing and provides electronic position feedback to the controller. 3 The next joint is the link. It acts like an elbow, and connects the arm to the base. A stabilizer support provides positional control to the link, allowing it to move in a predetermined path. These components contain bearing mounts into which pivot shafts are bolted. Each bearing is prelubricated or provided with a lubrication line or fitting. The link contains a position sensor which provides another position signal to the controller. An industrial robot can contain 2,000 individual parts and is assembled by teams. These teams begin with the base, and assemble components into the robot until it is complete and ready for testing and finishing. connected to the drive shafts. Since the arm and link joint must withstand the entire load of the wrist, this is accomplished with large bearings and a pivot pin. 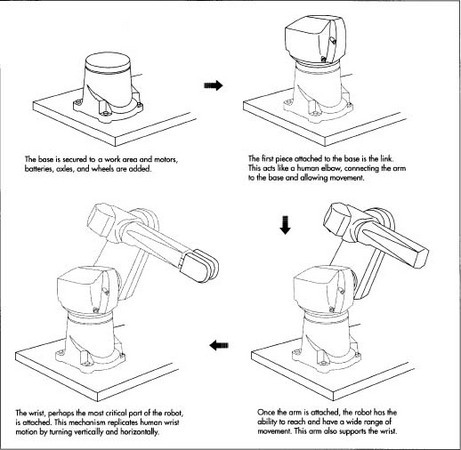 5 The wrist is the critical mechanism of the robot. It is the wrist that most replicates human motion by twisting and turning to place the paint gun, welder, or other tool in the correct position. Many robots also have load-sensing electronics in the wrist to signal when an obstruction has been hit, or when a load is too heavy to safely pick up. Additional position sensors and tool control electronics are also assembled into the arm and wrist. motor's sensors and electrical components must have wires for power and to carry information back to the control computer. Occasionally, unused space in the arms and base provides a handy place to mount some of the controller electronics, shortening the wiring paths. Hydraulic and air cylinders have hoses that carry pressure to operate them, controlled from the valves in the base. Most of these wires and hoses are routed back to the controller cabinet which, for mobile robots, is attached to the base. If the robot is stationary, this controller is usually mounted several feet away and is connected by an umbilical cord. After assembly, the arms and column of the robot are sometimes covered with guards and shields to protect them from paint spray, welding sparks, or other hazards in the environment. Installation occurs at the user's site. If / stationary, the robot is secured to the floor with bolts. If moving, a guide wire is buried into the floor for the robot to follow from task to task. It follows the wire by radio signals and also uses the wire to communicate with the central controller. Recently, lasers have been used to eliminate the wire. The robot is guided through its path by a laser beam reflected off the walls. Some designs also incorporate video cameras. Stationary applications usually require that fences be constructed around the robot so an unsuspecting human doesn't wander into the robot's work area and be injured. After installation, the robot manufacturer usually provides operation and maintenance training to the customer. Testing consists of two parts: functional accuracy and a process known as "burn-in." 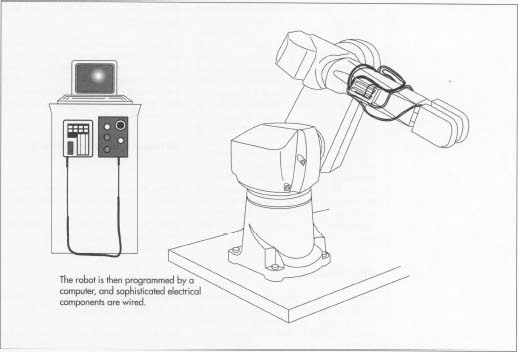 Once the assembled robot is energized with power, a computer program instructs the controller to move the robot arm through a series of motions. Accurate recordings of these motions are made, any problems corrected. Then the robot is placed into operation continuously for several hours. This is called burn-in, and it serves two functions. First, any loss of accuracy can be detected using the data from the functional test. Such an instance would indicate a design problem, loose assembly, defective bearing, or the like. Second, the trial run brings the electronics and hydraulics up to operating temperature. This is important because the controller is programmed with correction factors called offsets. These offsets compensate the feedback from the position sensors to allow for temperature variation of the components. With the machine warmed up, the programmer can place the correction factors into the program to provide optimum performance. Robotics is one of the fastest growing segments of the industrial machine market. Driven mainly by advances in computer technology, older robots are quickly made obsolete by new models. Japanese firms are leading the development of robotics, and many of their designs incorporate the new science of artificial intelligence which allows robots to "learn" and "adapt" their operations on their own. Advances in cameras and electronic vision will also impact the robot in the 1990s. Many robots will enter new areas of use such as medical and food service, which will bring more people into contact with them than previously occurred in the industrial workplace. Berger, Fredericka. Robots: What They Are, What They Do. Greenwillow Books, 1992. Ulrich, Robert A. The Robotics Primer: The What, Why, and How of Robots in the Workplace. Prentice-Hall, 1983. Edelson, Edward. "Robo Surgeons." Popular Science, April 1995, pp. 62-65, 90. Kirschner, Suzanne Kantra and Bob Sillery, eds. "What's New: Dexterous Digits." Popular Science, April 1995, p. 11. Ã˜	Identifying skill levels of operators, Multi skilling of operators through proper training, delegating area ownership in their respective areas. Just to say that hydralics have not been used to power robots for several years now. Gas springs are sometimes used to balance a robots mechanical system but motive force is supplied by brushless AC servomotors in almost every robot. Robots are also not reliant on heavy bases to keep them stable - they are bolted to the floor, wall, or gantry, often via a baseplate, raft or other metalwork. Otherwise nice piece.